Hums like a fine organic motor. 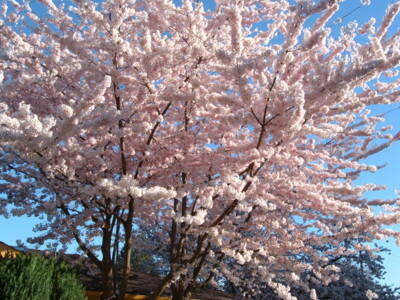 Every spring in those parts of the world blessed to have cherry trees, a miracle happens. As the days grow longer, but when the humans are still complaining of the cold and wet, the leafless tree begins to bud. The buds begin to sprout. The buds turn to blossoms. The tree becomes a beacon of pink light that surpasses any manmade art. Before that show is done, honey bees awake from their winter sleepover and the tree not only blazes pink, but it hums. Eventually, as an annual lesson in impermanence, the blossoms begin to fall. But they don’t just fall. In a gust of wind the observer is treated to a pink snow flurry that reminds that winter is truly over and summer will be on soon. Leaves sprout and the cherry tree takes on the appearance of an ordinary tree. Cherries may follow, and that’s when some people get interested in the tree. So do the robins and jays who carry the cherries away and leave the pits where a new tree may grow. The spring metamorphosis from seemingly lifeless hunk of wood to dazzling flower show, just happens. The tree has no calendar. Nor do the bees, for whom the show is intended. It is a natural system that has worked this way since long before there were people to marvel at it. We are the beneficiaries of the beauty in the spring, the shade in summer and the fruit in autumn, but it’s not about us. There is a lesson for us though. During the long, dark, cold winter, the cherry tree appears to be dormant, but dormant is not dead. Recession is not an end. The tree just waits until the conditions are right for blossoms. No not quite that. It waits for conditions to be right for budding, but not yet for blossoms. Blossoms are not the beginning nor the end, they are one point in a process that goes on step by step over and over. It works, because it is in harmony with the sun and the rain and the bees and the birds. If you have the good fortune to be where you can see flowering plants, take time to look. See their beauty. Allow yourself to awe at the natural system that brought that beauty to your eye, and at the natural system that you are who can perceive beauty. Note your response to the impermanence that is innate in all things, but that flowers manifest so strikingly. Can you accept that impermanence with equanimity? Open to the unity of life, to the miracle of living. Grow your patience with the life process and be ready for the next unfolding.